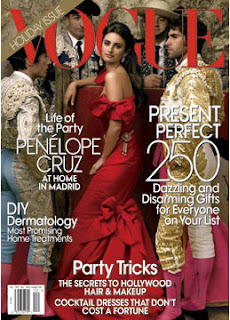 Vogue's revamped Front of Book is really great. It's dynamic and brings a little bit of youth to the pages of the magazine. I can't wait to see what else you have in store. PS. Tell Anna that Penelope looks magnificent on the cover. Excellent choice. Lately she's been looking spectacular, and in this cover, she just brights. Absolutely, the pictures inside are amazing too, with all the toreadores and the dancers. Really magnificent.